This is an SATB choir of high school age to senior citizens who sing a broad range of sacred music from classical to contemporary. Brass, woodwind, and percussion instruments often accompany this ensemble. We rehearse on Wednesday evenings in the sanctuary from 7:00 p.m. to 8:30 p.m. and participate in worship twice a month and for special festivals. This group has been ongoing since 1894 because of the love the congregation has for music. 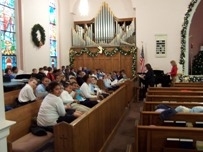 Every student in Christ Lutheran school sings in choir and participates in Christ Lutheran’s worship services at least four times a year and for Advent and Lenten services. Kindergarten-2nd grade Choir sings age appropriate Christian music. 3rd – 5th grade Choir sings anthems in two and three-part harmony. 6th-8th grade Choir sings a variety of anthems in three-part harmony. Students from this group also participate in music festivals and contests. In 2002 they recorded a CD. The Adult Handbell Choir is open to all who would like to play the bells in a worship setting. Practices for the choir take place on Monday evenings from the beginning of September through June. Bells are also played by the Children of Christ Lutheran School during worship services. Practices are held during the school day for this group. This is a praise band that performs during the contemporary worship services.